Saturday Night Live has suffered over the past decade from poor writing and sub par sketches. We all miss the recent success of the Farley/Spade/Myers/Sandler years. While SNL has slumped in quality, it continues to churn out funny movie stars. Kristen Wiig is the latest product to come out of the factory and is turning out to be the female version of Will Ferrell. When Ferrell broke it big in comedies on the big screen he was about 37 years old (Anchorman / Elf). Wiig is 37 and with Bridesmaids she now cements herself as one of the leading comediennes in Hollywood. With a leading role and co-writing honors on this film, she asserts herself as a comic genius and powers the raunchy-yet-heartwarming female version of The Hangover. 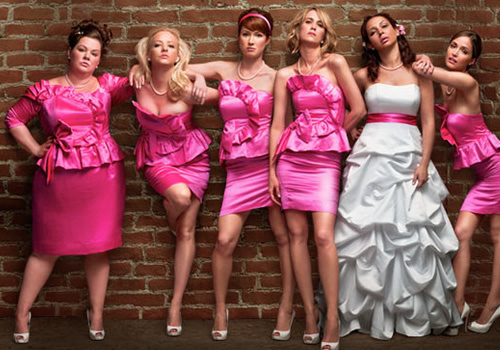 An ensemble cast of brilliant actresses make up the center of Bridesmaids. Maya Rudolph (yet another SNL vet) plays the bride (Lillian) who's best friend (Annie / Wiig) competes for maid of honor duties with a rival socialite (Helen, played by Rose Byrne - from Get Him to the Greek fame). Most of the movie revolves around the preparation for Lillian's wedding and we get the typical over-the-top Judd Apatow scenes that push the bar of the MPAA R Rating. Annie is constantly battling with Helen for claiming the role of Lillian's best friend and the ensuing confrontation brings out the best in Wiig's comic freak-out acting (very similar to Ferrell's blow ups). Fortunately the story is not a rehash of other buddy comedies. There's one point where it looks like all of the cast is headed to Vegas for a wild bachelorette party that will attempt to out-do The Hangover, but events arise on the flight out west and we're treated with an original adventure that tops anything that would have happened in Vegas. The signature scene in the film happens when the wedding party attempts to try on dresses at a fancy establishment in New York right after they get sick from eating some bad meat at a Brazilian restaurant. I'll leave out what happens at the store, but it's by far the funniest scene in a movie filled with laugh out loud moments. Apatow again produces a comedy with a winning formula that falls in line with his other hits (40 Year Old Virgin, Knocked Up, Superbad, etc..). He is the undisputed king of comedy concept right now and it doesn't look like he plans on producing a dud any time soon. Wiig is really strong in her first lead role. She's likable, down to earth and perfect at delivering subtle gags throughout the film. Of all the bridesmaids in the movie, Melissa McCarthy, who plays the rotund and slightly butch Megan, steals the show. She has some of the best "did she really just say that?" lines in the film. All in all, Bridesmaids is a well-worth-it hilarious time at the movies. I initially thought this movie was going to be a "chick flick" when I heard about it which is far from the truth. This is a classic in-your-face ridiculously funny treat of a movie. Assuming you fall in line with the Apatow brand of humor, you'll thoroughly enjoy this film. You could possibly wait until DVD to catch this though as there's no real added value to seeing it on the big screen. A very solid 4.5 out of 5 JRs and this movie should hold up as one of the funniest of the year. It looks like the upcoming Hangover II will have to be really good to top it.